Please bear with us as we reconstruct our website! supporting, protecting, and defending persecuted Christians in Iraq and the Middle East . Iraqi Christian Relief Council exists to support, protect, and defend persecuted Assyrian, Syriacs, and Chaldean Christians in Iraq and other countries in the Middle East by providing emergency humanitarian aid, prayer support, and advocacy. We involve the Christian community worldwide by encouraging Christians to take action in their community. Use your voice to help the Iraqi Christian Relief Council. Keep Iraqi Christians in your daily prayers. Some primary prayer requests include: safety for the returning families, provision for those families, and gaining increased support in this mission. The simplest way to help Assyrian, Chaldean, and Syriac Christians of Iraq is to make a financial sacrifice, large or small. We invite you to help us continue to serve this persecuted community. The Lord has gifted each of us with different talents, and we all have a network in which we work. Use your gifts and your network to raise awareness and help this cause. Go to our volunteer page to engage in some other helpful volunteer activities! Invite experts to talk about the genocide of our fellow Christians. ISIS came in the summer of 2014 and nothing has been the same since. The terror group attacked Nineveh Plain cities, towns, and villages where they deliberately destroyed churches, businesses, homes, and infrastructure amounting to a US government-recognized genocide. To support the return of thousands of families to their ancestral towns, Iraqi Christian Relief Council has been working with the communities on the ground in Iraq through the donations received for the Operation Return to Nineveh initiative. Through your generosity we have been supporting education, medical needs, rebuilding of homes, building water infrastructure, feeding the persecuted families, furnishing their homes, and distributing Bibles, just to mention a few. 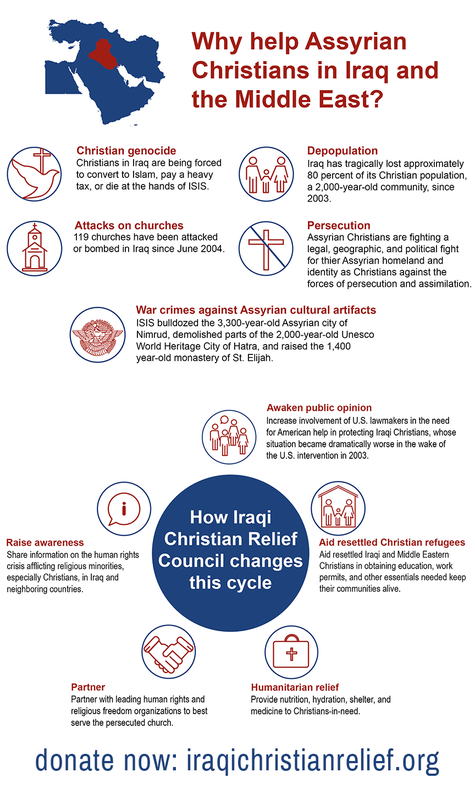 Thousands of Assyrian Christian families have been displaced through religious persecution and ethnic cleansing. These victims have been abused, tortured and are tired of running. Hope is hard to find. With your support we’ve already helped thousands–and now we invite you to join us as we support the plight of Assyrian, Syriacs, and Chaldean Christians in Iraq through our humanitarian relief. Download our poster to print and share on your church or community bulletin board, and share the message and mission of aid, advocacy, and prayer with Christians around the world.